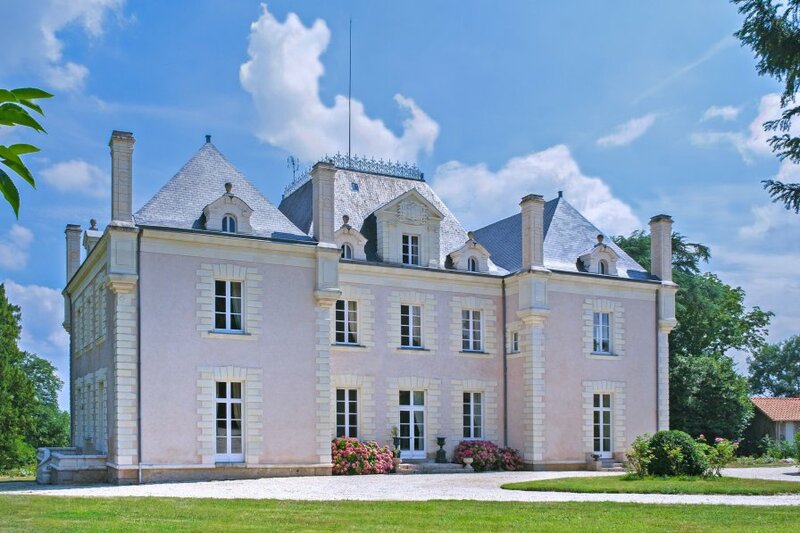 Chateau Anais is an outstanding ‘Folie Nantaise' completed in the 19th century, regally set at the crown of 6 hectares of private parklands, dotted with mature trees, overlooking a quaint pond. Chateau Anais is an outstanding ‘Folie Nantaise' completed in the 19th century, regally set at the crown of 6 hectares of private parklands, dotted with mature trees, overlooking a quaint pond, rolling grass meadows and vineyards which lead down to the river La Sevre. Just 15 minutes south of Nantes, you are perfectly positioned to relax and enjoy the quiet countryside but also to explore all the wonderful farmers markets, galleries, museums and boutiques that the town has to offer. Whether serviced or self-catered, Chateau Anais is a charming rental, operating as a weekly let during the high season and a B&B in the low season. Regardless of the season, you will find a consistently warm and welcoming ambience across 7 spacious bedrooms, 6 with en-suite rooms. The decor creates an air of sophistication that is timeless, whether relaxing in the cosy lounge, or exploring the library complete with indoor games and honesty bar. Guests will delight in whiling away the days in a private heated swimming pool, exploring the surrounding gardens or taking in the picturesque views from the balcony over a glass of the local cabernet. Without doubt this is the ideal setting to stage an unforgettable event or family gathering that will last forever in the memories of all those who attend. - Both main living rooms have access to the terrace overlooking the gardens, petit pond and vineyards, the perfect spot to savour an aperitif and toast a glass of champagne. - There is also the library where you can find some peace with a good book and enjoy a little nightcap. - The Master Suite is also located on the ground floor and includes a spacious bedroom, sitting room, dressing room and a large bathroom with separate bath and shower, and a speaker system. - This bedroom is perfect for parents with babies and small children and we have a porta-cot available for use. - Stairs from the entrance lead up to the 1st floor where you will find 6 bedrooms. - There is a bedroom in each corner of this floor, each modelled on one of the four seasons. - Hiver (Winter) overlooks the pool and old 'Pressoir', complete with ensuite bath, shower and toilet. - Printemps (Spring) is a light and airy bedroom with en-suite separate bath and shower. This bedroom, at the rear of the chateau overlooks the gorgeous gardens and vineyards. - Ete (Summer) in the other front wing is simply delightful with an English rose garden feel and has a bath/shower ensuite. - Automne (Autumn) at the rear overlooks the parkland, where you can sometimes spot little red squirrels, and the vineyards at the back of the property. Automne bedroom has a bath/shower ensuite. Front and centre is the Imperial Suite, a spacious and recently renovated bedroom and ensuite (shower only) and is the best room to enjoy the sun setting between the front entrance gates. - Finally there is the Chambre d'Enfants, decorated with children in mind, but can sleep adults. This room has one single bed and a set of bunk-beds sleeping two. This is our only bedroom without an ensuite. - Our pebbled driveway will lead you through the entrance gates, past two faux moats. - To the right of the chateau is our private, heated and child-safe 10mx6m pool adjacent to the old 'Pressoir' and caretakers residence. - Sun-beds are available and there is a pergola with table and chairs to enjoy lunch beside the pool. On the right of the chateau is the parkland with towering pine, oak and chestnut trees with woodland cyclamen flowering under their shade. - There are rose beds dotted throughout the garden, which is constantly growing with new additions, and a lovely grassy area behind the chateau for children to play. - Take advantage of the onsite BBQ, table tennis and trampoline. - Beyond the inner gardens, there are meadows to the left (where there is a little sheep house) and to the rear leading down to our petit pond, and further on to our small orchard of apple, mirabelle and cherry trees. - You can take a walk out past the chateau's stone wall and go exploring through the many walking tracks winding through the surrounding vineyards. - There is a tennis court and a volley ball ground. The local village of La Haie-Fouassiere is just a short, pleasant stroll from the chateau. There are two bakeries, a butcher, a pub, restaurant and there is a small fresh food market on Wednesday mornings with fresh fruit and veg, fish, meat vendors and the best fromagerie (cheese producer) in the area. The Italian-esque town of Clisson with its beautiful architecture and imposing ruins, is only 14 km away and offers plenty of shops, restaurants, sights, music events and charming parks on the banks of the river where you can enjoy a picnic lunch or take advantage of the many water activities on offer. There are also fantastic markets that fill the town centre on Friday mornings. Nantes, a 15min train ride away, is known as a cultural hub of France. Visit the impressive Chateau des Ducs de Bretagne and wind your way through the streets of Nantes' old town to take in the sights and explore all the museums, churches and cathedrals, art galleries, and specialty boutiques. Foodies will be spoilt for choice with restaurants and quirky bars, and those hungry for culture will surely be satisfied with the city's vibrant live music scene and full calendar of events. For a truly unusual holiday experience while in the city, be sure to head over to Ile de Nantes to visit Les Machines de l'Ile and take a ride on the 12m high mechanical elephant.